A lot of people are in a LOT of trouble and no one is talking about it.. in fact there is a concentrated, organized effort by the media and the US government to hide the truth from the American people. A chart just published on the Mid America Land Restoration / Microbes / Probiotics’s Facebook page today, shows that alarmingly high radiation levels are being seen from one end of America to the other. More disturbing is the Nuclear Emergency Tracking Center’s algorithm, which is explained by a representative in an article by Live Free or Die on January 2, 2014, doesn’t list these areas at “alert” levels because the radiation levels have been so high for more than three months, they are now considered the norm for that area. Radcon 2,3,4 show the direction that the NORM background radiation is going, if the levels are show up on the map, then the NORM background radiation is rising in the 3 month sliding scale. If the Radcon 1 ( green) shows up then the radiation has leveled off or decreasing like in Japan. In fact, it appears that CPM levels are rising throughout the West coast now, even though RADCON 5â€²s are not being issued. Are RADCON 5â€²s ONLY issued when a 3 month high is reached? 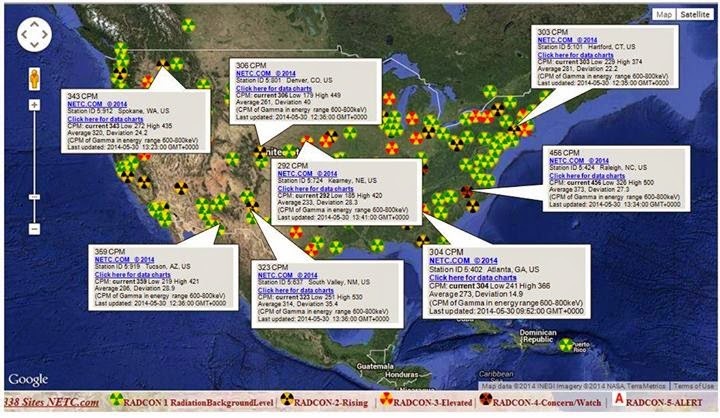 It seems that extremely high levels of radiation are consistently being reached on the West Coast now WITHOUT RADCON 5 alert being issued. In the video below I go over not only these numbers but the details of the highs for these areas and the lows… the lows are important because even the lows are what are considered dangerous levels, yet nothing is being done about it. Related – Mayo Clinic’s Radiation Sickness Page for people to see what symptoms occur when exposure is high.